Getting your Tourism Event Listed on VisitNJ.org is Simple! The purpose of the New Jersey Division of Travel and Tourism website VisitNJ.org is to promote the State as a destination for travelers all over the world. This is achieved by including tourism related information about cities and towns, attractions, hotels and lodging, articles and events on the website. Event must be related to the tourism industry, open to the general public and appeal to visitors not just a local audience. Event must take place in New Jersey and/or have primary focus of a location in New Jersey. An Event does not constitute as an everyday occurrence that takes place, there must be an element that is out of the norm which makes it special and considered an event. Event listings will not be published that are solicitations or contain any profane language and content. Events will only be accepted for possible approval via the online Entry Form once an account is created in the database. Emails, press releases, and other forms of media are not acceptable. All submissions will be reviewed by the Division of Travel and Tourism to determine that the event meets the criteria and is related to the tourism industry. The Division of Travel and Tourism reserves the right to edit, modify, restrict or remove listings at any time without notification. A tourism event listing must be submitted through the online Entry Form from your account. Venue name and physical address of event. Public contact phone number for additional information (email if available, but not mandatory). Photos and videos can be uploaded, we recommend you upload at least one photo for the website. You will be prompted to log-in to our database, either create a new user or use your existing account if you have one. If you have forgotten your username and/or password, please submit the online form for a password reset. Once submitted, you’ll be able to add website links, amenities, descriptions, contact information, photos and videos. The more information you add, the more robust your event listing will appear to attract more visitors. Review and verify that all the information you have provided is correct and then return to the dashboard. Your event is then automatically submitted to Division of Travel & Tourism to review and will remain red until the event has been approved. Once approved, all tourism-related events will appear on VisitNJ.org within one week of receiving your submission. 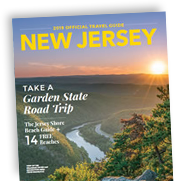 The VisitNJ.org Tourism Listings are provided as a free service to New Jersey residents, tourism businesses and organizations. Though the Division of Travel & Tourism moderates the posting of acceptable listings on the website, it does not constitute an endorsement by The State of New Jersey, Department of State and Division of Travel & Tourism. If an entry includes a third party website, the State of New Jersey does not control the content or operation of that website and cannot guarantee neither the authenticity, accuracy, nor security of the link, website or content linked there to and we will remove if not appropriate for our website. The State of New Jersey urges you to exercise caution when accessing any unfamiliar website.